This is one of the more pricey portable spa options in relation to just an inflatable hot tub, but is already a next step towards a deeper, sturdier tub. Dimensions: 27″ L x 73.5″ W x 27″ H Weight: 85 lbs. empty, 2569 lbs. full of water. The muscle relaxing hydro-massage provided by Spa-N-A-Box is provided by the 1HP Turbo Wave Massage System. Spa-N-A-Box plugs into any regular 120 volt household power outlet with no additional installation or tools required. Perfect for indoors, smaller spaces, on a deck or outdoors. 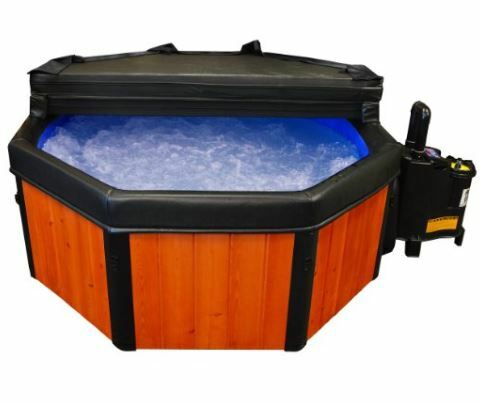 Unlike larger and sturdier acrylic hot tubs, Spa-N-A-Box Portable Spa is a more affordable option for single family homes, condos, apartments, decks or patios, camping and RVs or basements. It accommodates 4 people and sets up in less than 20 minutes. Also includes a thermostatically controlled heater with freeze protection. As with all inflatable and lower end spas, the warmup time will take longer, especially in cold weather, because the wattage of the heater will determine how fast the water can heat. Keep spa covered during heating phase to speed up the heating. The newer Spa in a Box actually has real wood (Florida Cypress with redwood stain).